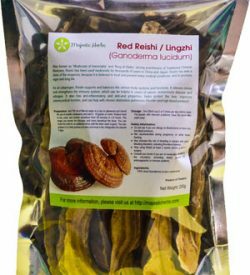 The many health benefits of Jiaogulan are mainly due to the saponins (called gypenosides) and antioxidants contained in the plant. 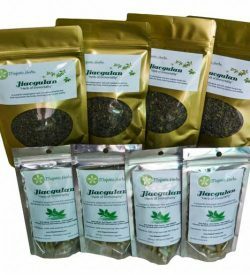 Therefore, preparing your tea in a way that extracts the maximum amount of saponins and antioxidants is important to gain the most out of this magnificent herb. Start with the best quality water you can find. This can be either bottled water or tap water that has been passed through a high-quality water filter. Using clean drinking water is important not just for preparing your Jiaogulan tea, but in general for your daily water consumption. Heat the water to a temperature of around 90 Degrees Celsius. The easiest way to do this without using a thermometer is to first bring the water to a boil, then remove from heat and allow it to cool for 2-3 minutes. Add about 1 to 2 teaspoons (1-2g) of dry Jiaogulan leaf for each 8oz/250ml cup of water. If brewing in a pot, add an extra teaspoon of tea for the pot. Cover and allow the tea to steep for at least 10 minutes. 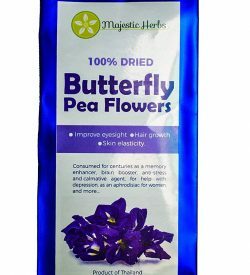 You can leave the tea leaves in for up to 2 hours, extracting the maximum concentration of beneficial saponins. Enjoy your healthy and delicious cup of tea! You can reuse the tea leaves up to 2-3 times, increasing the steeping time with each brew. However, the leaves should be used the same day; do NOT reuse leaves overnight. You will notice some soap-like bubbles forming in your cup when you pour your tea from the pot. That’s a good sign! It means that you’ve extracted a lot of saponins from your Jiaogulan tea, because one of the properties of saponins is to become soapy when in contact with water. The more bubbles you see in your cup, the stronger the tea’s healing qualities. 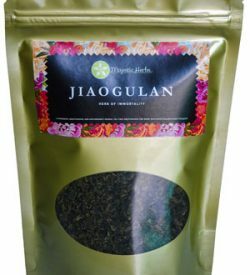 If you’ve never tried Jiaogulan tea before, start by drinking 2-4 cups per day. Alternatively, you can take 2 capsules, 2 to 3 times per day with a glass of water (two capsules are roughly equivalent to a cup of tea). If you don’t notice any discomfort during the first week, you can slowly increase your daily intake. For various reasons, it may be difficult for some to drink the recommended amount of tea (or more) every day. If this is your case, you can either supplement with capsules, or increase your dose by increasing the amount of tea leaves you brew. For example, you could add several grams of Jiaogulan per cup instead of the usual 1-2 grams. Like many other herbs, it is best to take Jiaogulan on an empty stomach, either half an hour before or a couple of hours after a meal. It is best to spread your Jiaogulan intake throughout the day instead of taking it all at once. 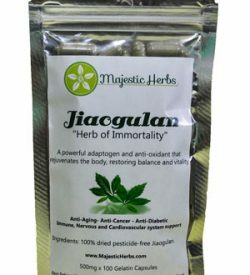 Jiaogulan is completely safe and non-toxic and can be taken in relatively large quantities for an extended period of time without any ill effects. In fact, throughout the centuries many people have been taking the herb daily for life without any negative consequences.